Thursday November 27th 1924 Thanksgiving day. Hattie and Cora came over early. Fannie had a fine dinner. Will Bremner came early in forenoon. We had all of the day together as The Whetstones did not go home till late bed-time. So glad to be here. Friday November 28th 1924 Ott went to Marengo for part of the day. We girls went to town before noon and Will came back with us. After dinner went to the station for Ott. It snowed late in PM. Will & Emily went home tonight. Hattie & Cora in Cedar Rapids. 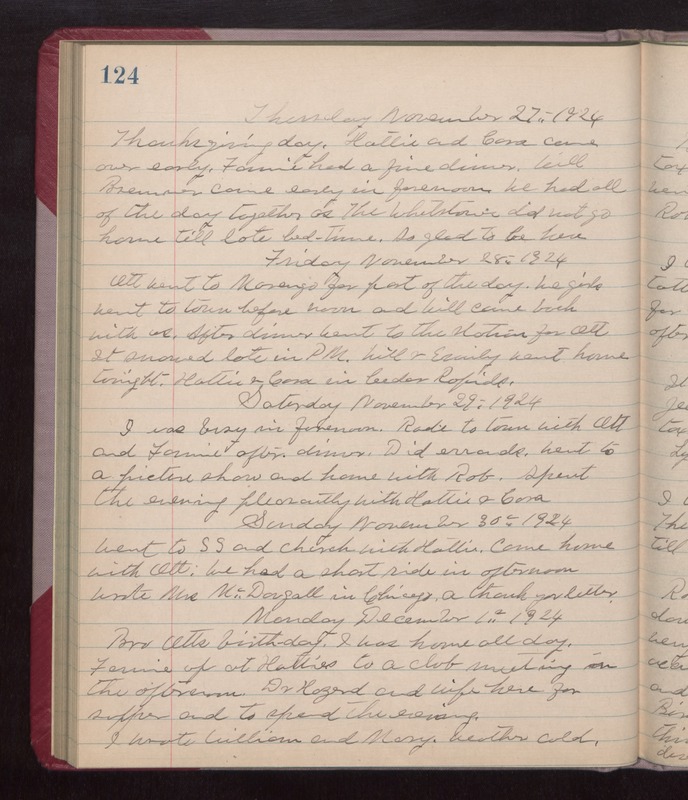 Saturday November 29th 1924 I was busy in forenoon. Rode to town with Ott and Fannie after dinner. Did errands. Went to a picture show and home with Rob. Spent the evening pleasantly with Hattie & Cora. Sunday November 30th 1924 Went to S S and church with Hattie. Came home with Ott. We had a short ride in afternoon. Wrote Mrs McDougall in Chicago a thank you letter. Monday December 1st 1924 Bro Otts birthday. I was home all day. Fannie up at Hatties to a club meeting in the afternoon. Dr Hazard and wife here for supper and to spend the evening. I wrote William and Mary. weather cold.